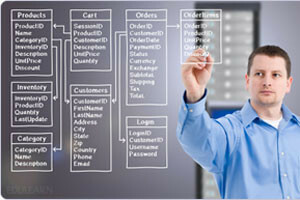 A database administrator, also written DBA in the field, is primarily responsible for data integrity in an organization. If you would love to work in the vast field of Information Technology and you have not yet chosen a title to pursue, it is important to familiarize yourself with the duties and responsibilities of several different occupations within that field. By doing this, you can make an informed decision about your professional future and scratch professions that do not really interest you off of your list. For very straightforward information on the role of the DBA in today’s modern business world, read on. Database administrators work in a wide variety of different settings. If you would like to still pursue the title of DBA, you can look for available positions in almost any type of industry in the private, public and governmental sectors. While many larger organizations do employ their own administrators who are employed directly for the company, there are also third-party database administration companies who will manage and secure servers for smaller companies who do not want to do it in-house. The cost of outsourcing the database administration is often lower than the cost of paying for in-house services. The demand for database administrators is on the rise as more and more tech savvy individuals have learned to gain access to private data electronically. According to the Bureau of Labor Statistics, the need for DBAs is projected to rise by 15% by the year 2022. Since you need no more than a Bachelor’s degree in Computer Science or a related field, this is a popular path for graduates who want to earn a large salary and want to enjoy a growing demand and consistency. Research for yourself what types of database administrator jobs are available in your area, and decide if this is what you should study.